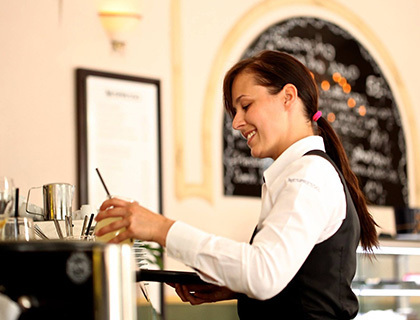 Learn more about Schedulefly - a top-rated restaurant employee schedule platform. Includes info about Schedulefly mobile, customer ratings, and FAQs. Schedulefly provides a clean and easy-to-use restaurant employee schedule tool. The platform is completely web-based and allows restaurants to manage staff schedules and communicate with staff and management quickly and efficiently. What's the price range of Schedulefly? Schedulefly pricing is affordable with no contract sign up and ranges from $30.00 to $60.00 per month for up to 79 staff members. They also offer a 1-month free trial to test drive their software. Schedulefly is a restaurant employee schedule program. It boasts a clean and easy-to-use interface and can be used on your desktop, smartphone or tablet. Its main feature is the ability to create and deliver daily schedules to employees via the web and/or email and text and lets you know who is coming into work that day. Schedulefly also has a host of other useful functions like the ability to store staff contact details and birthdays, upload and share important documents, keep track of labor costs, and communicate with management by sharing notes and events. How popular is online restaurant scheduling? Today, both small and large restaurant chains use online restaurant scheduling software to manage their teams more effectively. It has a variety of functions but most importantly allows restaurant managers to keep track of staff and encourage proactiveness and accountability. How does Schedulefly mobile work? Unfortunately for app lovers, there is no Schedulefly app. Schedulefly mobile is a website that can be accessed via any web-enabled mobile phone or device. All you have to do is log-in at schedulefly.com/mobile, insert your username and password, and you'll be directed to their fully-responsive site. You can choose to "stay logged in" and bookmark or save it as an icon on your device. Where can I find the Schedulefly login page? On the Schedulefly webpage, click "Sign In" in the top right-hand corner. You can also log-in at m.schedulefly.com and access the mobile or full website. We schedule between 55 and 60 employees each week and Schedulefly has enabled us to communicate with them effectively and effortlessly. It allows us to partner with them in working their schedules and provides them with the opportunity to engage with their fellow brigade members to give and pick up schedules. Simple, intuitive, restaurant-focused design allows seamless integration into your operation. The software's ease of use means no training is required and this means that a lot of formerly time consuming issues - shift trades and shift checking for example - are so easily done that I have forgotten what it was like before we started using Schedulefly. It works, it's consistent, it eliminates so many unnecessary miscommunications, it empowers our crew and allows flexibility with scheduling across the board, whilst strengthening the teamwork mentality. It keeps everyone accountable and connected without being invasive. Schedulefly is the best - we highly recommend them! The software is extremely easy to use, but also comprehensive in its scope. I own 2 restaurants and Schedule Fly has made my life much easier! Super easy to use. Relatively inexpensive for what you get. Schedulefly has helped make my restaurants run more smoothly. I can't imagine not using them. I'm a manager and use Schedulefly daily. We hire an average of 150 people to our team for summer, it is the only way to keep track, forecast payroll budget and communicate our day to day needs. Schedulefly is more than just a scheduling platform; they make my business run more smoothly. Accessible to every employee and easy to use. I can use it on my phone and IPad. I love the daily crib sheet function. Schedulefly makes running 4 restaurants a lot easier! Allows me to know who is working on a day to day, keeps ask offs organized in one place, allows me to communicate with any one of our many employees from one platform. Amazing customer support, easy to use, intuitive. Schedulefly is the best scheduling program on the market. The customer service is second to none. My staff loves the program.